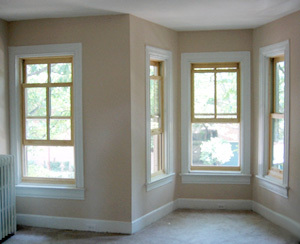 Eric Walker is a perfectionist with over 20 years of professional painting experience. Eric provides Top Quality & affordable residential Interior & Exterior painting services to satisfy Upper Cape Cod homeowners. Move furniture and household items away from the work area. Cover furniture with plastic from dust and paint. Cover all flooring and rugs with drp clothes. Clean all work areas daily; leave the home neat and clean after every day's work. Complete clean up will be observed at the end of each working day. Scraping all peeling paint and feathersanding. Filling all holes and cracks in plaster. Skimcoating all cracks, mud and taping any sheetrocking repairs that need to be done. 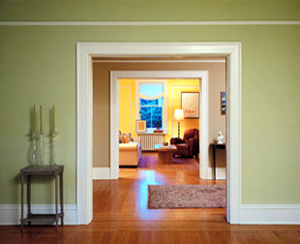 Caulking all cracks between trim moldings, walls, baseboards, and ceilings. Sanding to ensure smooth surfaces & Top Quality finish. Dusting and cleaning all sufaces to prepare to paint. Primer always applied to natural wood, barewood, and other unpainted surfaces. After washed and bleached etc., stain blocking primers applied to grease, smoke, or water stains. Oil base primer is used for exterior preparation priming and sealing. Once all of the preparation and priming work has been completed, our experienced painters will apply the first finish coat to your home interior. We will apply one to two coats of primer and two coats of finish paint. This is a three coat process, one coat of primer, sanding in between each coat, and two coats of lifetime warranty finish paint. 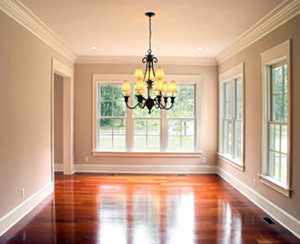 We paint all residential interior surfaces walls, ceilings, trim, mouldings, staircases, railings, closets, furniture, refinishing hardwood floors, kitchen cabinet painting, and all home interior surfaces. If your looking for a Home Improvement Specialist who does it all, look no further !